Ukraine in January-July 2018 increased imports of manganese ore and concentrate in natural terms by 1.5% compared to the same period in 2017, to 580,980 tonnes. According to customs statistics released by the State Fiscal Service of Ukraine, during this period imports of manganese ore and concentrate in monetary terms increased by 32%, to $113.953 million. Main imports were from Ghana (51.97% of deliveries in monetary terms), the Republic of South Africa (22.82%), and Russia (15.71%). In January-July 2018 Ukraine reduced exports and re-exports of manganese ore and concentrate in natural terms by 29%, to 29,491 tonnes, in monetary terms by 2.4%, to $2.144 million. Exports and re-exports were made to Hungary (44.47% of supplies), the Russian Federation (18.71%), and the Czech Republic (17.64%). As reported, Ukraine in 2017 increased imports of manganese ore and concentrate in natural terms by 36.1% compared to 2016, to 1.303 million tonnes, in monetary terms by 69.3%, to $223.434 million. Major imports were carried out from Ghana (41.28% of deliveries in monetary terms), the Republic of South Africa (22.73%), and Russia (19.23%). 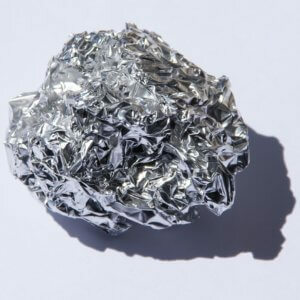 Ukraine in January-July of this year increased imports of aluminum ore and concentrate (bauxites) in natural terms by 6.3% compared to the same period in 2017, to 2.772 million tonnes. According to customs statistics released by the State Fiscal Service, during this period bauxite imports in monetary terms decreased by 1.3%, to $109.994 million. At the same time, imports were mainly from Guinea (57.99% of deliveries in monetary terms), Guyana (35.86%), and Brazil (5.48%). In January-July 2018 some 45 tonnes of bauxite were re-exported to Poland for $5,000, whereas in January-July 2017 some 22 tonnes of bauxite were re-exported to Poland for $1,000 and 140 tonnes worth $9,000 to Russia. As reported, Ukraine in 2017 raised imports of bauxite in natural terms by 21.8% compared to 2016, to 4.864 million tonnes, in monetary terms by 36.9%, to $212.370 million. Imports were carried out mainly from Guinea (45.92% of supplies in monetary terms), Guyana (28.72%), and Brazil (14.86%). As a whole, in 2017 some 162 tonnes worth $10,000 were exported, whereas in 2016 re-exports were not carried out. Ukraine in January-July 2018 increased imports of nickel ore and concentrate in natural terms by 13.4% compared to the same period in 2017, to 891,674 tonnes. According to customs statistics released by the State Fiscal Service, in monetary terms nickel ore imports rose by 13.5%, to $43.584 million. At the same time, imports were made from Guatemala (71.01% of deliveries in monetary terms), and Indonesia (28.99%). For the seven months of the year, Ukraine did not export and re-export these products, as well as in January-July 2017. 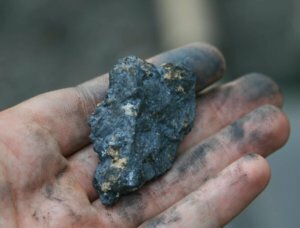 As reported, Ukraine in 2017 reduced imports of nickel ore and concentrate in natural terms by 4.2% compared to 2016, to 1.314 million tonnes, in monetary terms by 8.3%, to $64.172 million. At the same time, all imports were from Guatemala (100% of supplies). Pobuzke Ferronickel Combine (part of Solway Group) imports nickel ore to Ukraine. 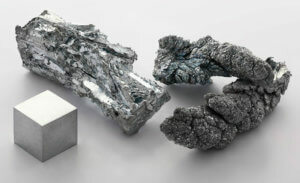 The plant processes about 1.2 million tonnes of ore a year. 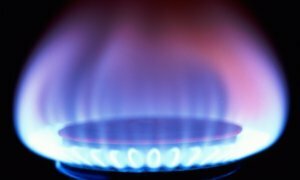 Ukraine imported 4.179 billion cubic meters (bcm) of natural gas in January-June 2018 to the tune of $1.150 billion, the State Statistics Service of Ukraine has said. In June alone, Ukraine imported 909.638 million cubic meters (mcm) to the tune of $243.205 million. Thus, the average price of gas imported by the country in June 2018 was $267.4 per 1,000 cubic meters against $263.5 in May, $310.8 in April, $278.7 in March, $261.1 in February and $279.4 in January. Counterparts in the six months were companies from Switzerland, which supplied 1.719 bcm worth $473.753 million, Germany (1.355 billion cubic meters, $368.69 million), Poland (333.983 mcm, $98.985 million), the United Kingdom (310.497 mcm, $83.879 million), the Czech Republic (134.362 mcm, $36.236 million), Hungary (117.564 mcm, $31.243 million), Slovakia (88.978 mcm, $23.759 million), Luxembourg (57.82 mcm, $16.155 million), the Netherlands (24.425 mcm, $6.506 million), Austria (21.281 mcm, $6.364 million), and Italy (16.284 mcm, $4.337 million). Natural gas was not imported from the Russian Federation in January-June 2018. Ukraine exported 4,560 tonnes of cheese in January-July 2018, which is 6.1% less than in the same period in 2017. According to customs statistics released by the State Fiscal Service, in monetary terms exports amounted to $17 million – at the level of the seven months in 2017. At the same time, cheese imports in January-July 2018 amounted to 6,640 tonnes, which is 29.8% more than in the same period in 2017. In terms of money, this indicator increased by 43.6%, to $32.68 million. 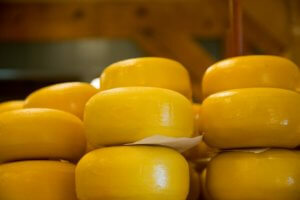 Exports of butter from Ukraine in January-July this year rose by 32.2%, to 19,230 tonnes. In monetary terms, this figure grew by 1.5 times and amounted to $82.84 million. According to the State Fiscal Service, imports of this product increased by 2.7 times, to 637 tonnes ($4.26 million). Exports of milk and cream (condensed) in January-July decreased by 20.8%, to 22,360 tonnes. Ukraine supplied condensed milk and cream for a total of $36.83 million against $48.78 million in January-July 2017. Imports of this group of goods increased by 1.7 times, to 1,230 tonnes ($3 million). 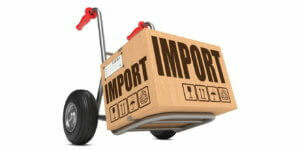 5 countries control over half of all goods imports to Ukraine. Foreign trade operations were conducted with partners from 210 countries, but Russia, China, Germany, Poland, Belarus are in top-5 among other exporters of goods to Ukraine. According to the statistical data, Russia is the first exporter of its good to Ukraine with 14,8% of all trade volume, the second is China (12,1%). 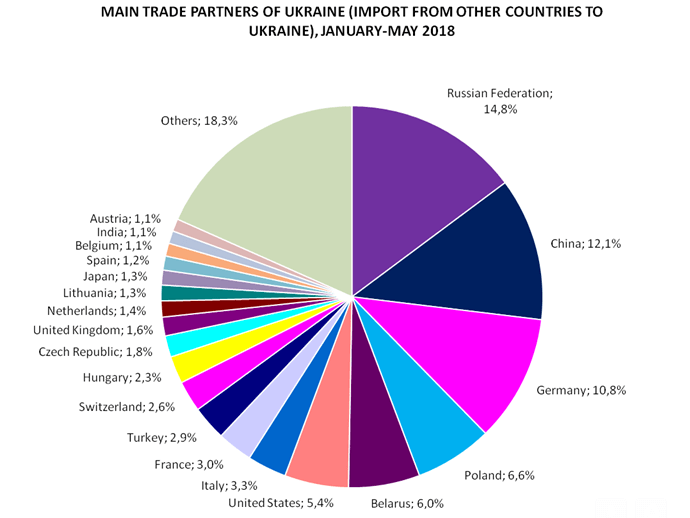 The USA is the 6-th exporter to Ukraine, the UK is on the 13-th place. The deficit of Ukraine’s foreign trade in goods in January-May 2018 increased by 1.4 times compared with January-May 2017 and amounted to $2.055 billion, the State Statistics Service has said. According to its data, in May the deficit was $632 million, while in April some $221.6 million, in March $460 million, in February $457 million, and in January $284.1 million. In January-May 2018 exports of goods compared to January-May 2017 increased by 12.9%, amounting to $19.460 billion, imports by 15.3%, to $21.515 billion. In May 2018 compared to the previous month, the seasonally adjusted export volumes decreased by 5.8%, imports by 13.4%. The seasonally adjusted foreign trade balance in May 2018 was negative and amounted to $946.5 million, negative indicators were also fixed in April 2018 at $570.8 million, in March at $508.2 million, in February at $411.8 million, and January at $580.5 million. The ratio of coverage of imports by exports was 0.9. Foreign trade operations were conducted with partners from 210 countries, a share of top-20 importers to Ukraine is more than 75% of a total volume.